Goal planning from the heart! Uncover, discover and create. Envision your dream for 2019 and set your soul. Take a journey to create from the heart, uncover what you need to let go and discover what you desire; then set your mind, body and soul to receive. Conscious soul goal planning from the heart! You will connect to what you want to experience and how you want to feel from the inside; then connect it all to the outside world with committed, inspired actions to live into the vision; to reach your desires and conscious goals grounded in the truth of who you are. What's included in the workshop? ... you let go of anything holding you back from living your your dreams? ... you trusted that the universe has your back? ... you were living the best day of your life every single day? What you believe you will achieve. *Please bring your yoga mat. At its simplest, a vision board is a powerful tool that allows you to visualize your future and consistently remind you of your desires and goals. It is a collection of images, symbols, phrases and words that evoke your desired state – your vision moving forward and for the upcoming year. We are supercharging this vision with an emotion – your desired feeling for the year along with a word of the year. The act of creating a vision board helps you connect to your desire in a tangible way. It breathes life into your desire. Later, when your vision board is hanging in your home or your office, it will serve as a reminder and connection to your mind, body, heart, and soul; training your brain and connecting your thoughts and feelings with inspired action; the real law of attraction. Penny has helped me in more ways than I could possibly begin to express… Whether it be family matters, money anxiety, business stressors, employee struggles, or friendship conflicts, she has always been there, willing and able to guide me through the process of uncovering the root problem of the matter at hand. I have attended 2 of her meditation, manifestation, and vision board workshops, and both were absolutely fantastic! Penny creates sacred space for expression, and healing. Her assistance is direct, but is done with nurturing kindness, and respect; the kind that allows one to really open up, to begin to do their work. I cannot recommend a better, more beautiful, bright, magical and wise soul, than that of this woman to guide one on their journey towards self-betterment. Thank you, dear Penny, for all of your love and support over the years. 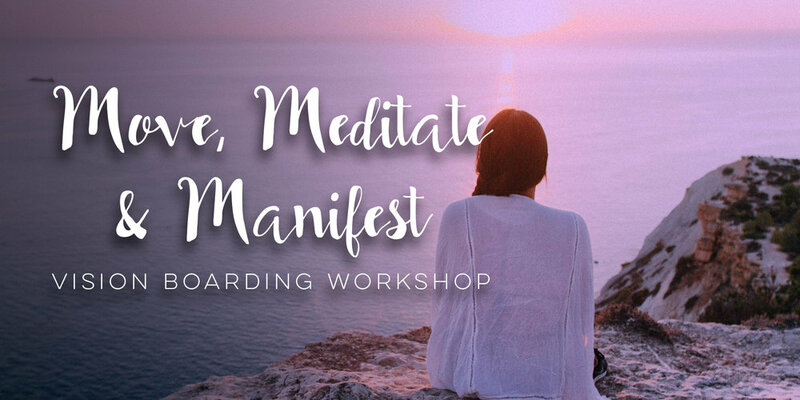 I saw a friend post the ad for Penny's Move, Meditate and Manifest: Vision Boarding Workshop on her Instagram and I signed up right away. I had created a vision board by myself once before and I am a firm believer in manifesting your inner desires and goals and having a vision board to remind me of them every day. I remember thinking this is exactly what I need in my life right now. And it was. Penny is such an amazing human being. She is warm and kind and makes you feel appreciated. She created an amazing atmosphere in the workshop: people who were mostly strangers felt really comfortable sharing their inner thoughts. She guided us through a wonderful yoga session and meditation. Penny has an amazing skill set in helping you figure out what you want in life and how you want to feel. I was in awe with everything she said and I could have listened to her for days. I created my vision board and it sits on my desk and I look at it every day. It not only brings be joy but also reminds me every day how I want to feel and what do I want in life. I learned a lot about myself during the workshop and because I want to keep learning, I also want to take the workshop again. Because not only did I love it, I also feel it was very beneficial to my life. I highly recommend this workshop to anyone who wants to learn who they are and where they want to go. I’ve had the beautiful opportunity to be coached by Penny and to attend her visions and manifestations workshop in December 2017. Penny has challenged me to go beyond the limitations I had previously set for myself, and she creates a space for me to both share my experiences as well as find ways to push forward. I appreciate that Penny comes from a place of openness and non-judgement; she fosters a transparent environment for coaching and growth. At the end of the day the responsibility falls on my shoulders - however, Penny has helped me to take personal accountability and she creates conversation that aids in channelling my passion into possibility.